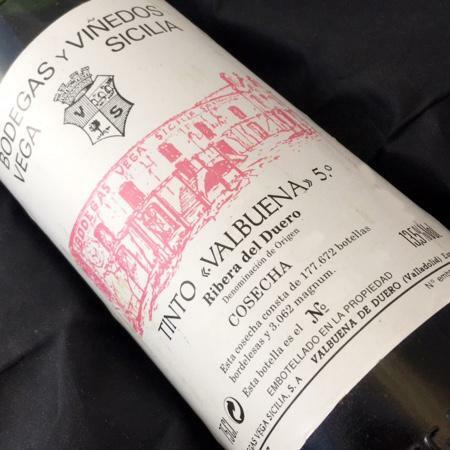 Vega Sicilia is the maker of this 1980 Vega Sicilia Valbuena 5º Año , a red wine from Ribera del Duero that is made of tempranillo, merlot, malbec and cabernet sauvignon of 1980. The 1980 Vega Sicilia Valbuena 5º Año is the ideal red to combine with hard cheese and foie. 4 of 5 points is the average score of this red according to Uvinum users. - Nose: aromas of ripe red fruit. - Mouth: balanced, tasty, fresh and elegant. Of velvety, round, with soft tannins and well-placed wood. Persistent. AGEING: Aged in new oak barrels, American and French, before passing a semi-new casks. PAIRING: soups and vegetables, ratatouille with eggs or green beans with foie, poultry, grilled meats, stews and braised meats, rice with vegetables, or with lobster, lamb roast or stew. I took the Vega Sicilia Valbuena 5º Año with my couple in a romantic plan. If you want to buy 1980 Vega Sicilia Valbuena 5º Año, at Uvinum you will find the best prices for Ribera del Duero red wine. Save money with Uvinum, online, safe and with all the guarantees. We have more than 59.000 products for sale in our catalog which vaults us to the top of the mountain in selling wine, beer, and spirits in Europe with more than 38.000 satisfied customers.